Been asked to look at a heatsink for KX3. The underside of the heatsink has been etched with the maker VE7FMN callsign. I have a build for someone to finish first but will then fix this to #2334 or #1082 and do some tests. 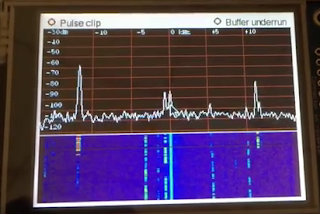 Interesting looking at the work from KO7M and his dual Si570 Arduino shield, used in the Minima... it is only a prototype currently but it is an intersting option. 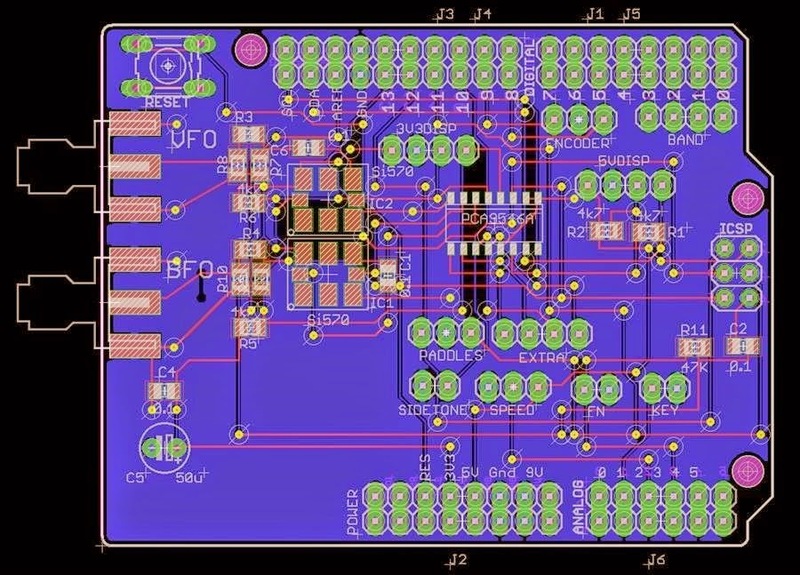 The image is not mine but his, looks like an Eagle PCB layout (perhaps). KO7M mentioned this is still a prototype that the SMA connectors kinda foul with the USB connector from the Arduino Uno underneath... I guess moving them down a bit (on the image) would work but too much and then Arduino power barrel connector socket then might foul with BFO SMA... I wonder if it might better if the SMA connectors were mounted 90 degrees to the PCB, the ability to stack the boards might be effected (if another were to be added). The pins would have to be cut very close to the underside of the board (unless SMT versions used). I expect LPF would need to be fitted to the Si570 outputs anyway and these might be better off board anyway. I've seen a similar usage suggested recently using those little AD9850/AD9851 boards from ebay/china... one provides the VFO the other the BFO frequency. These boards contain an LPF (a poor one) the little row of SMT devices between the blue output pot and the 1/2 size clock can are an LPF.... It is better to just remove it and use an external LPF. I picked one up at G-QRP Convention at Rishworth and looked over a dual DDS version (not a shield yet) that was being used with a clone of Drew Diamonds TCF Transceiver. I am going to be looking at the I2C libraries for the 4x20 LCD and adding a VSWR, Power Meter and Supply Voltage to the LCD real estate. I like the option of using dual Si570 for the VFO/BFO and using an Arduino Uno and not the original base Atmega328 chip. 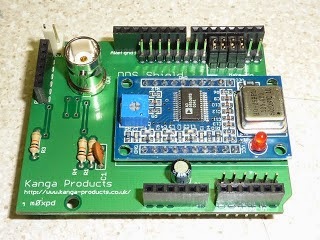 I might investigate the use of the Arduino Mega 2560 (as I have one) as it has extra I/O and I2C dedicated already. Also I have some alternate IF frequencies (as have the crystals) so might play a bit, as well as ADE-1 and SBL-1 mixers. This has been done before with a RaspberryPi... but I found it lacked a bit on raw grunt and the tiny TFT was, well tiny... the Banana Pi with a dual core 1GHz CPU and 1GB RAM etc is an interesting option as almost all hardware is an upgrade from the earlier RaspberryPi, who (whom?) have said they will not update the RaspberryPi hardware until 2017) So I will be taking a look at using it and I will also employ a more friendly 7" LCD (ebay) with HDMI and a touch screen. Asked recently how can I almost instantly recall or obtain details of circuits and designs....easy I have my own radio library. Quite a few volumes have been borrowed recently... No I do not post to anyone but I have found the odd thing for people (If I have time).